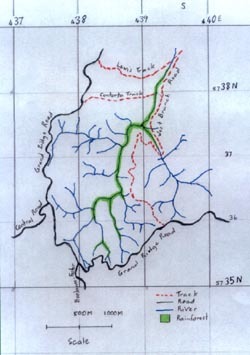 The main area of rainforest on the West Branch of the Morwell River is located on the tributary beginning at the Grand Ridge Road within the area of 1939 Mountain Ash regrowth (see map). 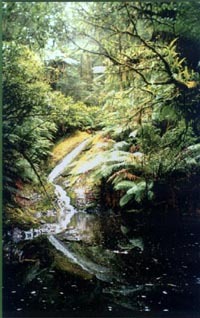 The rainforest extends down the West Branch to where Lewis Track branches off the Morwell West Branch Track. 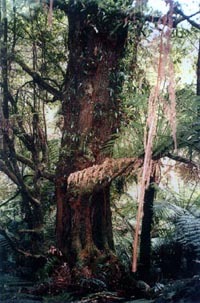 This rainforest contains both myrtle beech and southern sassafras and there are slender tree ferns and skirted tree ferns within this rainforest.. The sections where logging and the development of new plantations occurred in the 1960s/1970s, tend to have only scattered Myrtle Beech. Recent logging operations in 1997/98 have put further areas of this rainforest at risk. On the eastern side of the West Branch clearing has been carried out right to the edge of the rainforest. No buffer has been left to protect the rainforest. This has also occurred on the western side at Bell Boulevard. This section of rainforest is now at serious risk of destruction through myrtle wilt disease and should be monitored. Morwell West Branch has an important area of 1939 regrowth on the north side of the Grand Ridge Road, opposite the Franklin Reserve. It is important that this area of regrowth be conserved as it provides an extension to the small habitat area of the Franklin Reserve. This has become of major importance since the removal of many habitat trees south of the reserve at Stronach's Road and Red Hill Track. Most of the remaining regrowth and habitat trees in this area have been removed in logging operations in 1996/97, in the narrow strip between the tributary and the West Branch Track and in Bell Boulevard. However, there still remains another small area of 1939 regrowth on the south side of Craig Court. There is also an area of regrowth and native vegetation on the east side of the West Branch Track below Rodgers Road.